A journalist says she was "completely dehumanised" on stage during an Xbox One Event at Eurogamer Expo 2013, by a comedian who made degrading jokes about her gender. 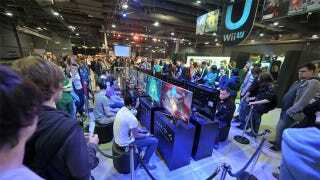 Eurogamer Expo says it is investigating the matter. Hope someone from Microsoft sees this. Your presenter made completely dehumanised me in front of an audience. Ruined my Eurogamer. Shows me for trying to take part and have fun like everyone else. Dale identified the presenter as Fraser Millward, a British actor and comedian. Screw not naming and shaming. I'm fed up of not naming these people. Dale said later that booth personnel attempted to apologize but would not bring the presenter out for Dale to confront him. People at the stage "appologise that I was upset by his comments". Refused to bring him out for me to talk to. Refused to give full name, refused to appologise for his actual actions. Eurogamer Expo's official Twitter account told several followers that expo staff were investigating the matter. An expo representative told Kotaku that comment on the matter was pending the completion of that inquiry. Microsoft's corporate posture is one of support for transgendered persons, through its GLEAM employee resource group, and the company has been visible in that support, notably sending a Halo Warthog and a Master Chief cosplayer to march in Seattle's most recent Pride parade. Dale later said "I doubt it was intentional," referring to the comedian's jokes about her appearance, "but doesn't make it any less humiliating." Update, 9/30: Microsoft gave the following statement: "We are aware of an incident yesterday on the Xbox booth at the Eurogamer Expo, at which an inappropriate comment was made, and we apologise for any offence caused." ...and I would like to take this opportunity to apologise for any offence and hurt I may have caused. Laura Kate Dale and Fraser Millward have come to agree that the situation which took place at the Xbox stand at Eurogamer on Sunday 29th September was an unfortunate misunderstanding on both sides. It has now been made clear that Fraser did not refer to Laura as an 'it' or a 'thing' or a 'he', and these claims have now been fully retracted by Laura and she is sorry for the hurt this caused. Fraser caused offence to Laura on stage when he publicly misgendered her by addressing her as 'this person'. Laura was also upset by statements which she saw as suggesting that she was not female. Fraser is sorry he said this, and for the pain he inadvertently caused Laura. Both parties wish to put the situation behind them and consider this matter now resolved. Update, 9/29: After the story was published, Dale stated that she wished it hadn't run, as it sparked numerous hateful messages sent in her direction. She asked for the story to be pulled, and while Kotaku has a policy against pulling articles, we've updated it as described in the Editor's Note below to diminish the harassment sent her way.